Keeping your computer running smoothly can easily turn into a full-time job – that is unless you outsource most of the hard work to a dedicated tool. This is just how Wise Care 365 could help to lighten your workload, making it possible to easily check your system for problems, clean up the registry and drives, as well as boosting overall performance. The program interface is broken down into a number of sections, with the first housing the PC Checkup tool which can be used to scan your system for problems as well as identifying possible areas for optimization. 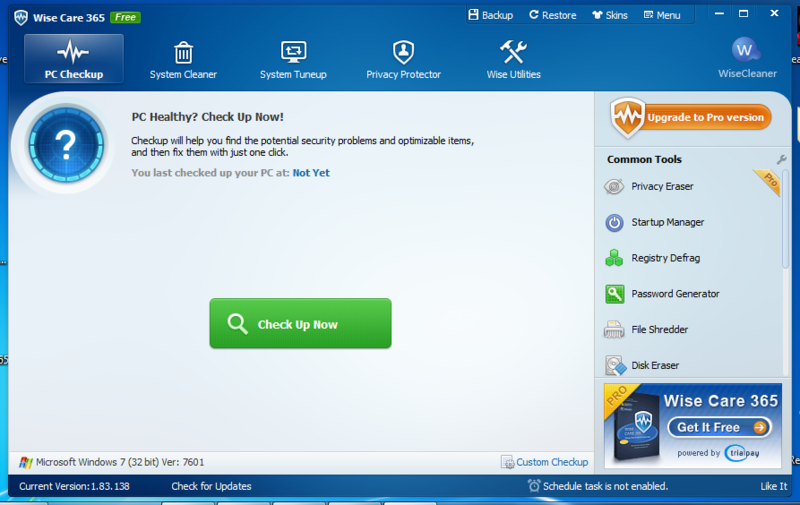 The System Cleaner section includes a registry and hard drive cleanup options, such as the ability to remove unnecessary files and components of Windows. The System Tuneup section is where most people will head first with a view to speeding up start times and boosting overall performance – the tools here are simple to use and seem to have a noticeable effect. There are a number of additional tools such as a password generator, file shredder and disk shredder, and these all help to make Wise Care 365 an incredibly valuable app. Some utilities such as the startup manager are nothing out of this world in terms of functionality but looked at as part of a larger picture, it is handy to have so many tools all available in one place. There is also a PRO version of the program available which unlocks access to a number of extra features, but if you’re looking for a simple clean-up and tweaking tool, the free edition will more than suffice. The main benefit of the paid-for version of the program is the fact that it opens up new options for maintaining privacy, but unless you are concerned about the ability to change the app’s skin, there is little more than is to be found in the free version. - Improved Registry Backup function. - Improved the function of Registry Cleaner. - GUI and usability improvements.